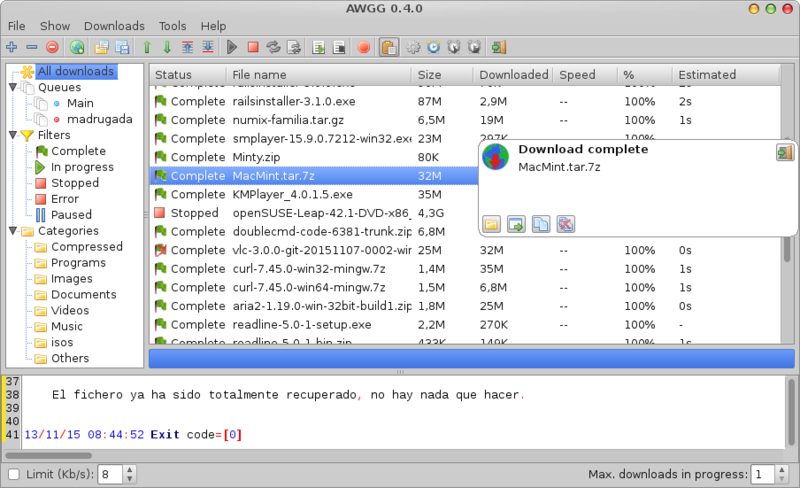 AWGG is an open-source portable download manager available for Windows and Linux. clipboard monitor and can be integrated to firefox with flashgot plugin and chrome with Simple Get plugin. AWGG comes from Advanced Wget GUI. AWGG is a lightweight multiplatform and multilanguage download manager, basically a wget frontend and other tools like aria2, curl and axel. AWGG is written in Free Pascal , using the Lazarus IDE. - Manage multiple downloads engines at the same time. - Supports HTTP, HTTPS, FTP. AWGG is natively portable and stealth. Download awgg-0.4.0-win32-portable.7z 7-Zip archive (the latest version), extract it and run awgg.exe, all AWGG data and settings are saved inside program folder (awgg.ini, awgg.dat, aria2.conf, wget.ini). AWGG is freeware and open-source, the source code is available at GitHub. AWGG is light on system resources, it has a clean and nice GUI and on Windows it can use Aria2, cURL and Wget download engines. AWGG can be integrated to Firefox via FlashGot but I haven't tested it. The developer- Reinier Romero Mir is very friendly, helpful and open to suggestions. Since AWGG is portable and multi-platform and since it supports all major command-line download managers I suppose that it may be very useful to many users. A free and open-source download manager available for all OS would be great. Not for the portable version. I have just tested AWGG with FlashGot and although it is not officially supported manual integration is easy and works perfectly in Firefox. smaragdus wrote: I have just tested AWGG with FlashGot and although it is not officially supported manual integration is easy and works perfectly in Firefox. Care to explain how you do it? 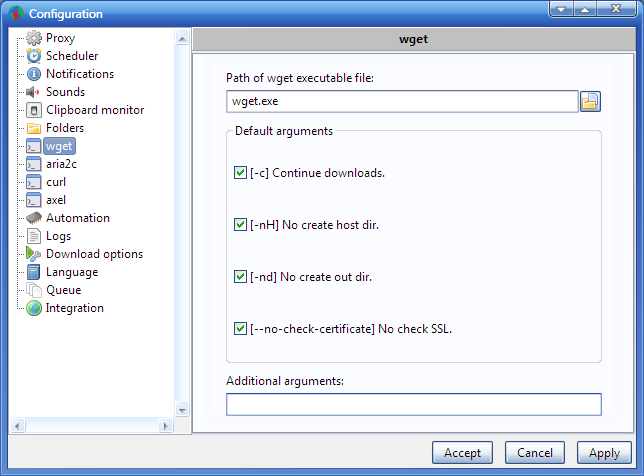 Firefox-> Tools-> FlashGot-> More Options-> Add and then browse to awgg.exe and select it. This worked with Firefox 28.0 and FlashGot 1.5.6.12 but I suppose it should also work with newer versions of Firefox. 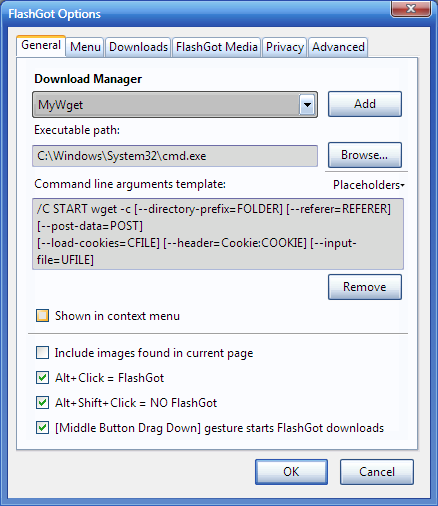 I hope you won't have any problems integrating AWGG to Firefox via FlashGot. Thanks, Midas. Will test the x64 version as well. smaragdus wrote: ... I hope you won't have any problems integrating AWGG to Firefox via FlashGot. Unfortunately, that's a negative. I'll explain: as I have detailed before (see screenshot below as well as viewtopic.php?p=73285#p73285), I use Flashgot to invoke Wget directly in a console window, as per instructions at http://flashgot.net/screenshots#options. AWGG v0.5.0 released (Spanish changelog at sites.google.com/site/awggproject/project-updates/awgg050). http://sites.google.com/site/awggproject/project-updates/awgg050 wrote: - Added support for youtube-dl engine. 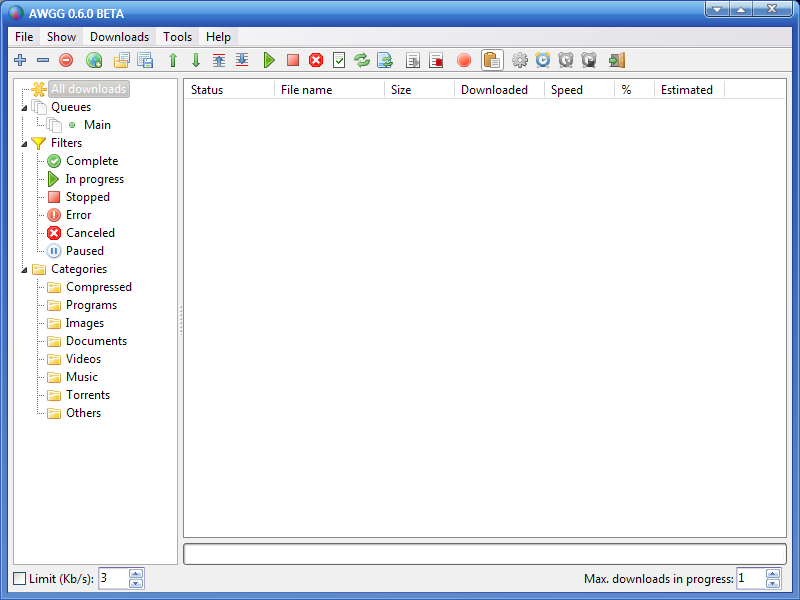 - Added option to use external downloader for youtube-dl engine. - Added ability to download videos from Youtube and another without extensions (thanks to youtube-dl). - Added option to get and set video formats available on Youtube and others. - Added a button to set queue position for new downloads. - Added ability to pre-select best engine for specific sites. - Added new button in the notification window to resume failed downloads. - Added total progress bar in the window of file operations and increase the speed. - New possibility of changing position of download by simple drag and drop. - New possibility of changing queue downloads by dragging and dropping to tree view. - The download list now displays information by hovering the cursor over a download. - The program can now capture file names by using the download engine (some cases fail with curl). - New program icon (made with LazPaint). - The code was entirely re-written for clarity and maintainability. - Tray icons are disabled by default in Linux to avoid a bug in some versions of Ubuntu. - Some debugging information added (only index lines) to 'awgg.err' error log. - New icons for downloads completed, missed or failed. - Various other bug fixes. -Added support for integration with Opera, Chrome and Firefox using the plugin (Download with Wget). -Added support for magnet links. -Added support to download complete playlists of Youtube. -Added option to change the URI for monitoring the Internet connection with its time interval. -Added option to not force names in the new download window. -Added option in the import download dialog to not force the names (in the file filter). -Added option to automatically start the main queue if Internet connection is detected. -Added filters, buttons and menus Cancel and Resume later. -Added notifications and sounds for the state of the Internet connection. -Added relative routes for engines and sounds. -Added the word Portable in the main window for this mode. -Added option for native system notifications. -Added button in the new download window to add the address to the domain filter of the clipboard monitor. -Added support to change the properties of multiple downloads at once. -Added intermediate state of the downloads as starting and stopping. -Added individual options to activate the different notifications and sounds. -Now the icon in the system tray turns gray if an Internet connection is not detected. -Now you get the name of the YouTube video automatically after the download is added. -Now the manually initiated queues stop if there are no active downloads. -Now the main queue does not continue if an Internet connection is not detected. -Now, only the download error notification is displayed after the last attempt. -Now the user information and passwords are encoded. -Now you select the best video format if you do not specify another one in the youtube-dl engine. -The position and size of the main window and the drag box are now remembered. -Corrected problem with the aria2 engine due to changes in the output. -Corrected error when multiple downloads were stopped at the same time. -Corrected error when making several clicks on the button to add download. -Corrected problem in the programmer. -Corrected problem with torrents downloads when they finished and seeding. -Fixed problem when incorrectly showing the speed and current progress of torrents downloads when seeding. -Corrected changes in the output of the youtube-dl engine. -Corrected error of Youtube video formats. -Corrected problems in the download icons in the system tray. -Corrected error that caused the closing of the program when stopping some downloads. -Corrected error to the sample the information of the estimated time of the downloads. -Corrected error when not detecting very long URIs in the monitor of the clipboard. -Corrected many small mistakes more. Great news! I was afraid AWGG had been abandoned. On first inspection, looks like the problem I had before has been solved in the Beta. OT: and yay! for post 4444.